Let us add some Hollywood style color to your guest’s faces. Our face painters are kind and very talented makeup artists. They adore working with kids to make every party fun and exciting for them. You will watch in amazement as the faces transform right before your eyes. This puts a smile on everyone’s faces at the party. We use real vibrantly colored makeup that is 100% safe for all to wear. FDA approved, hypoallergenic, comfortable and easy to remove! It doesn’t matter whether it is a superhero flying through the sky or whether it is a princess waiting for her pumpkin carriage. Imagine how they feel when they actually LOOK the part? We can help you with that. Our face painters know to get the job done as fast as possible while delivering the best results to make sure every kid gets to be who they want to be! Whether you are throwing a corporate event, a birthday party or just a summer barbecue and you want something to keep the kids entertained. 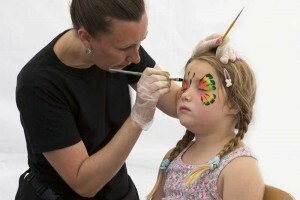 Let Ronjo Entertainments face painters brighten the kids day for a very affordable price! If you would like to hire our face painting service or if you would like to see some of the designs that we can do then please don’t hesitate to get in touch with us today. Our team would love to hear from you and we can’t wait to see how we can help you to get the entertainment you need for your child’s party or your next event.